David with that photo not sure if you've gone phishing or fishing. Have fun wherever you've gone! You betcha! Oops, that's a Palin-ism. Nope, I'm headed to Jeb Bush country. Lauderdale, here I come! Thanks Karen. I need some R&R. That, and picking up a new helmet . Your Vespa's are upside down. And don't lift your mugs or the coffee will spill out. Relax and enjoy!!! Bring some nice pictures back. WE drive a long ways for employment. YOU go a long ways for a helmet. 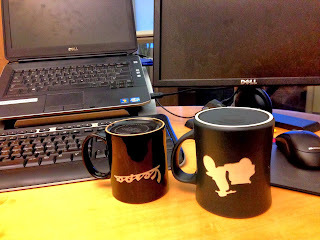 Bob, getting both mugs upside down without spilling the coffee is much harder than getting the caramel in a Caramilk! Oh... we are in the guest bedroom. Thanks Sonja, will do. Speaking of fun, check this out. Got it, took the labels off, installed the pinlock, played with the Robocop sun visor, checked out how the Sena will fit... Doug, what's 2,400 kms when there's a new helmet waiting for you??? Kids trick. Thin cardboard over the cup, flip over onto the table, pull out the cardboard quickly. Didn't you ever do this as a kid? I've done the reverse of that here in Florida when the occasional huge cockroach presented itself. I'm not a killer, more of a catch and release kind of guy. Try it, no plastic wrap needed as long as the cup and table are smooth. Deb, worms are ick! The only body of water I dabble in is the deliciously warm heated pool at my in-laws' condo. No worms needed. So where are the fish pics?